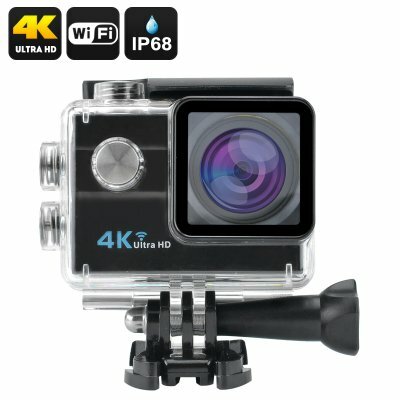 Successfully Added HK Warehouse 4K Wi-Fi Waterproof Sports Camera - 1/4 inch 16MP Sony CMOS, HDMI, 173 Degree Lens, 2 Inch LCD Display (Black) to your Shopping Cart. When you want to capture great quality video you need a good lens, thats precisely why this sports action camera has a 1/4 inch 16MP Sony CMOS sensor. You can rely on the Sony CMOS to deliver great quality image all the way up to ultra HD 4K resolutions, which it captures at 25 frames per second. If you're in to fast paced action then you set recordings to full HD 1080p and snap a massive 60 fps, or alternatively go all the way up to 120 frames per second at 720p. This ensure every split second of movement will be caught so you can capture the beating of a birds wings or every stage of your stunts in great resolution. The wide angle lens is superb for framing your shot and the world around you with its 173 degree view of the world. This allows you to capture the full scene as it unfolds for some spectacular shots. This compact sports action camera has a waterproof case allowing you to film underwater or in extreme contortions without any harm coming to the device. A 2 inch rear screen on this sports camera will allow you to review the action and chaeck your footage while a HDMI port makes it easy to share your films with friends on a large screen. Thanks to Wi-Fi connectivity it is simple to transfer the recordings wirelessly to your phone, laptop or computer so sharing them online can be done quick and easily. Thanks to the 900mAh battery, you will get up to 1.5 hours of continuous filming with this sports cam so you have the perfect device for recording all you outdoor adventures. The 16MP Wi-Fi Waterproof Sports Camera comes with a 12 months warranty, brought to you by the leader in electronic devices as well as wholesale sports action cameras. Delivery time - A+. Quality of camera - A+. Looking for a camera that is just like a GoPro? - A+. Great cam and an even better price! None. Total all-star all the way!